In 1968, President Lyndon Johnson signed the North Cascades National Park into existence and thereby protected 684,000 acres of old-growth cedar and ponderosa pine, rugged, granite peaks, and a smattering of nearly 300 glaciers in what is often referred to as the "American Alps." In fact, and in geological terms, the North Cascades are the most rugged and craggy mountains in the continental United States. From its verdant western green forests to the sunburnt, rolling eastern hills, North Cascades National Park serves up a variety and quality of terrain nearly uncontested in the West. The surprising bonus: It’s remarkably hidden away and sees a fraction of the traffic that nearby Olympic National Park does. Compare some 27,000 visitors a year to the nearly 3 million that travel to the Olympic National Park and you’ll start to understand what we mean here. The park is separated into two distinct regions—the North Unit and the South Unit. The dividing line between the two is technically the Ross Lake Recreation Area, which includes Ross Lake itself and the Skagit River that drains from Diablo Lake to the southwest. The highway is a clearer illustration of the boundary, and for ease of understanding we’ll use it as the divider.. Lake Chelan Recreation Area lies just to the southeast of the South Unit, and, because it’s so glorious and full of adventure, we’ve included it here. The North Cascades National Park is nestled into the larger Cascade Mountain Range—thus named for the seemingly impossible number of waterfalls that tumble and bubble their way through the rowdy terrain. A common theory postulates that, only 5 million years ago, the landmass was actually its own micro-continent; over millennia this small land mass traveled toward North America and eventually rammed into the behemoth mass, forcing the mass upward and leaving behind a tumult of terrain in its wake. An incredible variety of wildlife finds a haven in the park, from moose and black-tailed deer to black bears and chattering marmot. It’s nearly unheard of to spend a few days in and near the North Cascades alpine areas without laying eyes on a mountain goat, while bobcats and mountain lions, rarely seen, work to keep the populations in check. Though I-90 is the time-cruncher's way from Seattle to Spokane and beyond, a true traveler’s journey heads up toward Highway 20 and meanders the Cascade Loop, described by National Geographic Traveler as “one of America’s grandest, most spectacular drives.” We’ve affirmed this fact ourselves, as proven by the undulating terrain, the bubbling rivers, and the amazing pit stops. No trip is complete without stopping at the Gorge Overlook and the Diablo Lake Overlook. You’ll most certainly be sharing this view with others, but nothing can dampen the incredible views and vivid colors that are so spectacular you’ll feel like you’ve stepped out on the other side of C.S. Lewis’ wardrobe. Ready to kick off your trip and prefer to chat face-to-face with a park expert before you do? Visit the visitor center in Newhalem. Though "beautiful" and "majestic" may be the first words that come to mind when swooning over the jagged mountains within the North Cascade National Park, the first words that may come to a geologist's mind may be "complex" or "storied." Some of the rock within the park dates back 400 million years, and it has amassed a wide variety of matter since. Now, even the naked eye—when paying close attention—can spot rocks that are borne of volcanic island arcs, deep ocean sediments and basalt, parts of old continents, submarine fans, and even pieces of the deep mantle of the earth. Erosion has also played a mighty hand in shaping the North Cascades that we know today. The high amount of rainfall coupled with harsh winters has etched out sharp edges and deepened river valleys while glaciers buffed out their smooth tracks. The topography left behind is unlike any other. 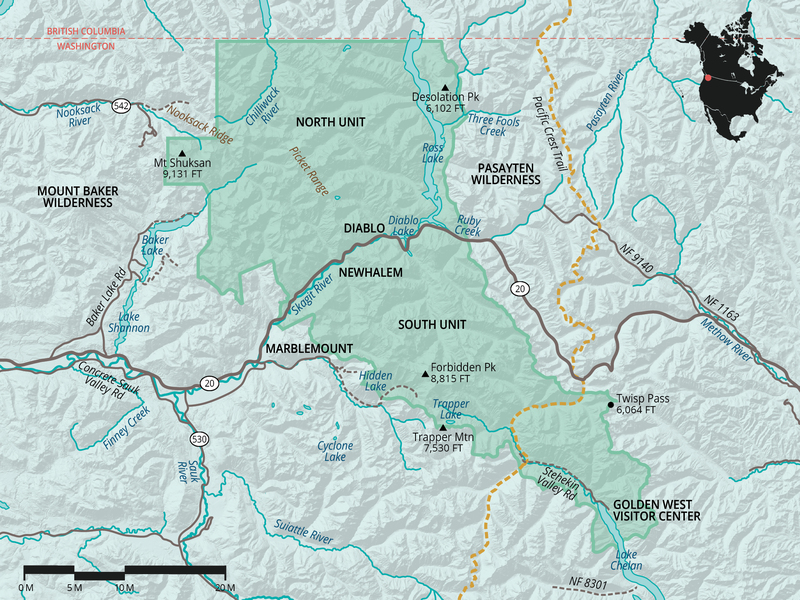 Though over 200 sites of archeological interest have been identified within the park, there is still much to be learned about the cultural and historical story of the North Cascades. What is known, though, is that traces of human existence in the area date back to nearly 10,000 years—a time during which the region was freshly uncovering itself from a long ice age. Prolific natural resources, curiosity about the unknown, and sheer beauty have drawn people to the area ever since. The first recorded expedition through the North Cascades was by Henry Custer's team as they picked their way through the Upper Skagit Valley in 1859. Guided by Fraser River Native Americans, they amazingly navigated the Skagit River all the way to the mouth of Ruby Creek. Stories of portaging massive log jams and almost getting swallowed up in the tumultuous rapids of the Skagit Gorge make the feat even more impressive. Though several mining and logging operations attempted to set up shop as the west became more populated, the sheer difficulty of transporting resources out of the region to go to market snuffed them out. Unlike other national parks where roadside attractions abound, and visitor centers and gift shops draw in the annual nonchalant tourists, most of the true attractions of North Cascades National Park lie deep in the mountains and require some effort (hike, kayak or boat specifically for the Lake Chelan entrance) to get to, hence the park's low visitation rates. And let's face it, the majority of visitors to our national parks venture little further than a mile past the road. Trust us: The effort here is well worth the reward. Mountaineering is a hugely popular activity in the region, and it's no wonder—the jagged peaks beckon from almost every viewpoint. Be sure to pay close attention to weather and permitting before embarking. The Golden West Visitor Center (509.699.2080) serves the Lake Chelan Area, and the Wilderness Information Center (360.854.7245) in Marblemount serves the north and south units. You must obtain a backcountry permit for ALL overnight stays in the backcountry. Keep in mind that permits are limited. Plan in advance. Backcountry camping abounds in the quiet, wooded nooks, but obtaining a permit can pose a real challenge. Instead, many visitors opt into visiting one of the five car campgrounds operated by the NPS in the North Cascades. Each campground within the park is notably busy, especially on sunny weekends, but the proximity to adventure and family-friendly nature of almost every last campground in the park simply can't be beat. Plan to arrive early and on Thursday if you plan to spend the weekend—most sites are first-come, first-served. Hozomeen Campground: Walk-in only access November to mid-May. Gorge Lake Campground: Open year round, no water, services, or fees. Newhalem Creek Campground: Spacious, no hookups, restrooms with flush toilets. 13 campsites and two group sites. Colonial Creek Campground: On-site amphitheater with programs, near Diablo Lake. 42 campsites and one group site. Goodell Campground: Smaller, quieter than Colonial Creek. 19 campsites and two large group sites. White River Falls Campground: Free, five sites, no potable water, not suitable for RVs. Grasshopper Meadows Campground: Free, five sites, no potable water, not suitable for RVs. Napeequa Crossing Campground: Free, five sites, no potable water, not suitable for RVs. Harlequin Campground: Boat-in camping. A great family campground. Weaver Point: Boat-in camping, treated water, access to Stehekin River Trail. Purple Point: Boat-in camping, short walk to campsites, treated water and flush toilets. Manly Wham: Boat-in camping, lakeshore camp near Bridal Veil Falls. Flick Creek: Boat-in camping, camp has access to the Lakeshore Trail. Sitting on the southern side of Ross Lake, Ross Lake Resort provides cabin-style accommodation from mid-June through October. A stay at the resort requires planning ahead, as reservations must be made one year in advance. The resort is not accessible by road, so getting there involves either a hike or taking a boat and truck from Diablo Lake. There is no restaurant or store on site, and guests must bring their own food. Pots, pans, electricity, tableware, and a propane grill are provided. Pets are not allowed at the resort. Reservations can be made on their website or by calling 206.386.4437. This behemoth mass of earth effectively forms a climactic barrier to the wet weather systems that are borne in the Pacific Ocean and slowly move eastward. As a result, the region sees impressive rainfall. The Diablo Dam on the Skagit River is home to a measuring station that consistently records over 70 inches annually. Thankfully, sunny days still abound in the height of the summer months, and you can even catch one during the rainy season with careful planning. Heavy moisture falls as snow as elevation climbs, so be sure to keep a close eye on local reports if you plan to enter the alpine in the shoulder seasons—even in the late spring, snow can persist long after it has melted away at lower elevations. As is the case with most national parks, pets are prohibited in most areas of the park. This is to protect wildlife and preserve wilderness opportunities for other visitors. The exceptions to this policy are notable, however, and give visitors more options to experience the park with pets than they can enjoy in most other national parks. Leashed pets are allowed within 50 feet of a roadway, along the Pacific Crest Trail, and within both the Ross Lake National Recreation Area and the Lake Chelan National Recreation Area. Stunning scenery. Remote backcountry. Relatively light crowds. Wild. Some areas are difficult to access. Seasonal access.